Gold solidus, 4.44 g., 20 mm., minted in Constantinople. Obv. Facing bust of youthful Christ Pantokrator, holding Gospels and with his right hand raised in benediction. Rev. 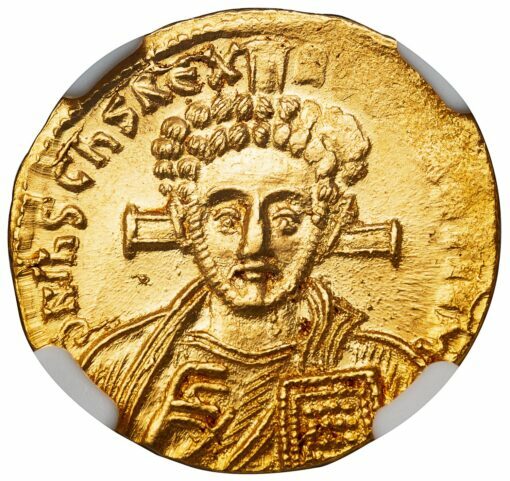 Facing bust of Justinian II wearing a loros and holding a cross potent in the right hand and a globus cruciger inscribed PAX in the left. Sear 1413; MIB 1; DOC 1. 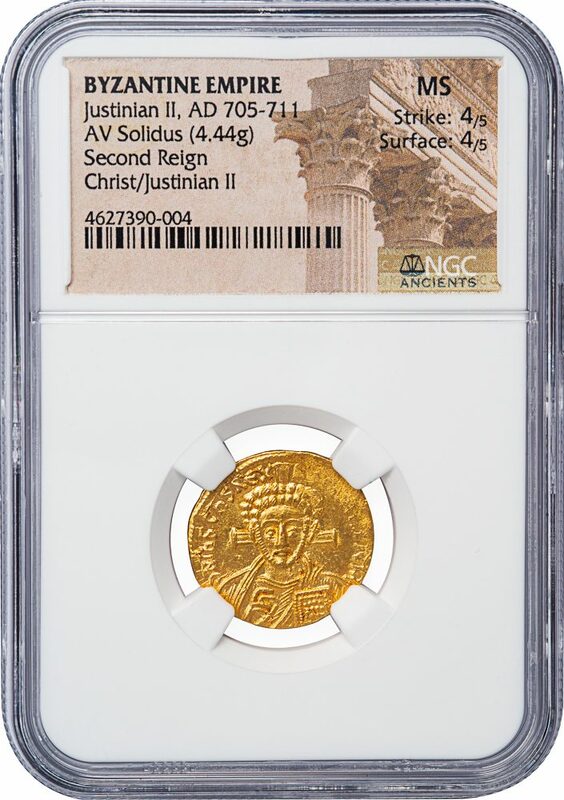 NGC graded MINT STATE, Strike 4/5, Surface 4/5, with an exceptional portrait of the young Christ. 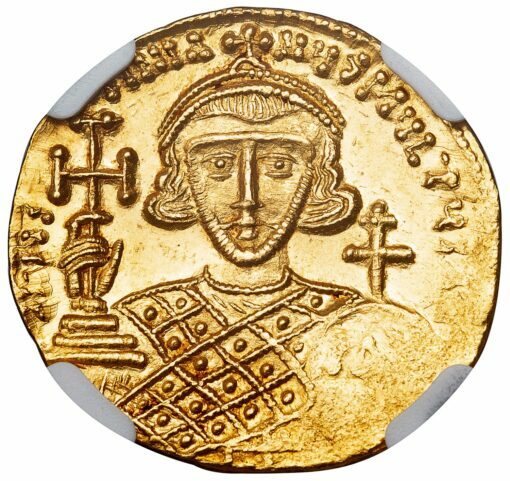 The introduction of the depiction of Jesus Christ on Byzantine coins takes place under Justinian II, whose rule is separated into two distinct periods, before and after his exile from Constantinople. During Justinian’s “First Reign” Christ appears for the first time on coinage, shown as a bearded man with the traits of a classical philosopher, accompanied by the legend “Rex Regnantium” (“King of Kings”). During his return to power following his exile (the “Second Reign”), Justinian II continues to employ the portraiture of Christ on coinage, but opts for an entirely new image – a youthful portrait of a distinct eastern physiognomic type, with curly short-cropped hair and a kind, welcoming, expression. It is an image likely based on the iconographical traditions of Christian Syria, and some have even argued that it originates in an icon of the “historical” Christ, the Christ before the Crucifixion. As the French numismatist Lacam has suggested, this younger portrait is Christ the Messiah, whereas the earlier bearded effigy of the “First Reign” represents the Lord as Christ of the Ascension and Redemption.